Mock mayors appear to be a common feature in English towns, indicating perhaps the joint characteristics of the English people a disregard for authority and a good sense of humour. In Staffordshire there were a number, of which that of Newcastle is the best known. The custom was centred on the real mayor making ceremony, for as soon As soon as this had finished, the free man of the town, those not involved in government, gathered in the Market cross and chose a Mock mayor in a ceremony which resembled that which had gone on to select the real one! “His Mock Worship was, with all the gravity befitting such an occasion, summoned by the shrill sound of a Nanny goat’s horn, to appear before his brother town’s men and show cause why – always provided if he had any objection to that most devoutedly to be desired and that most glorious and honourable elevation to the state of Mayor of the Borough, with all the customary privileges of getting drunk, and finding himself publically as an example, &c,. Then with great stateliness of step, and severe magisterial countenance some well beloved fellow townsmen was conducted to top step, and there invested with those most becoming and costly robes of state and that magic wand of office so capable of doing justice, on the person whose head it knocked. “O Yes, O Yes O Yes! This is to give Notice, First that by the advice of my Beadle, Mace bearers and Bum Bailiffs, I do hereby declare and proclaim that it shall be lawful for any man or set of men to put their hands into their breeches pockets if there be their purses and give and pay over to our exchequer any sum less than one hundred guineas, that shall deem to him or them fit in order that we may drink his or their jolly health in a quart of ale a –piece for which we as well our part as on yours promise him or them the distinguished honour of three huzzas, and may they live to do the like again next year. Secondly- That we, after mature consideration, do allow any grocer – so he do it handsomely and pleasantly to his own feelings the never-to-be-appreciated and valuable privilege (which must be thought a sufficient reward unto him and his children for ever) of giving unto our revenue collectors, as much tobacco as he pleases; provided always and it is hereby declared, that the amount must not exceeded one hundredweight, but shall, at the same time be enough to serve all the old women, as well as our worthy selves. Thirdly-that Morgan, the pipe maker, as his hereditary right, which he hereby acklodge may if he likes furnish us with saggar pipes to smoke the aforementioned tobacco with, in consideration whereof, we pledge our honour (here two squeaks from the nanny goat horn) that nobody else shall. Fourthly-Our worthy Mayor giveth notice and commandeth that all canting, gin-drinking women he brought before him, that he may punish them with the bridle, kept by him for that purpose; and he recommendeth his brother freemen to eat plenteously of roast beef and plum pudding, to gain which they must work more and drink less; and further, that all persons found drunk in the streets after this notice will be put in the stocks for one hour and thirteen minutes. 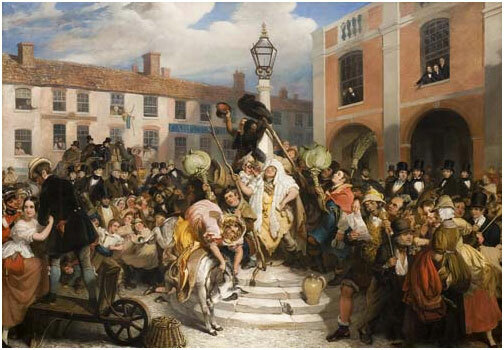 The nature of the proclamations clearly being aimed to ridicule the self importance of the Corporation, caused irritation which lead not only to the banning of the custom in 1830s but the putting of the mock mayor in the stocks. However, this revival was a final hurrah, as in the end the Municipal Reform Act of 1835 swept away all the rottenness associated with the real Mayor and the need for the custom and so it quietly died.